Bluetop is actually a term thought of by 4A-GE enthousiasts. They gave that name to the first generation 4A-GE engines, but it isn't completely correct. 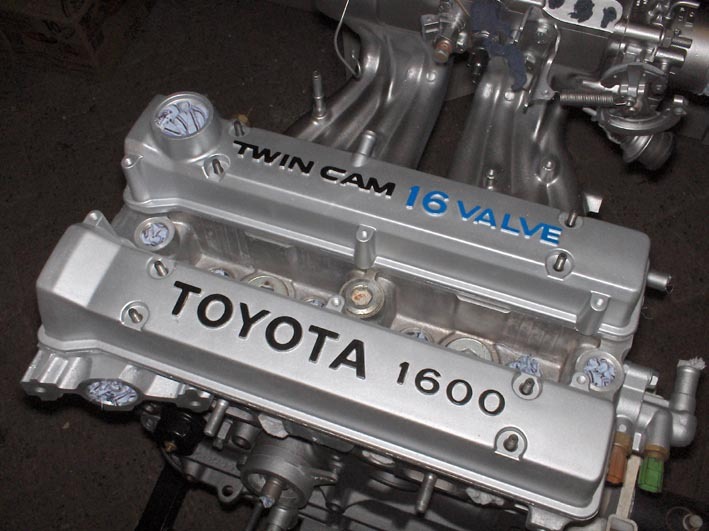 The first generations of the 4A-GE engine (build from '84 to about '89) had the embossed lettering '16 valve' on the valve covers painted in blue. Some use the term bluetop to distinguish the first two generations (the bluetops) of the 4A-GE from the 3rd generation (the so called redtop). But by doing this, it has already caused quite some confusion because valve covers can be swapped between engines end Toyota themselves had switched to red lettering even before the 'redtop' engine was introduced. My own 4A-GE Bigport being build with the original blue lettering restored! Because all of this I prefer the terms 'Bigport' and 'Smallport' to tell them apart. You can't really go wrong with these terms as it's part of the cylinder head design and the biggest difference between the 2 and 3 generations. And you can easily tell by looking at the intake ports of intake manifold. The difference in the intake ports of the smallport (above) en bigport (below). You could also look for the presence of the T-VIS system. That system was needed on the bigport engines to keep the velocity of the air high enough. The smallport didn't need this system as it had a higher air velocity because of the smaller intake ports. So rule of thumb: T-VIS system present it is a bigport engine. No T-VIS system present and it is a smallport engine. A little side note might be in order here. Some tuners remove the T-VIS system because they see it as a restriction when tuning the engine. Below you can find the specifications for the Bigport 4A-GE engines.